in the region it was purchased. USA for Warranty service – a factor to consider in making your purchase decision. to make the best purchasing decision for your needs. "I want to say how happy I am with my Wonder Mill. I have had it for 2 years and I love it. I brought it after becoming downright addicted to freshly ground flour that I would borrow off of a friend who had one. I haven't bought flour from a store since. I use it 4-5 times a week and love it. I know that I have sold at least 6 other people on your product - and have one friend who is borrowing flour off of me the same way I used to. We have a deal - I supply her with fresh flour and in return, she bakes wonderful things and shares them with me. I am pretty sure I have the better end of the deal, since grounding flour takes only a minute. Thank you, Eva"
"My name is Joe Stout and I work for Washington State University. I teach low-income students about the merits of healthy eating. 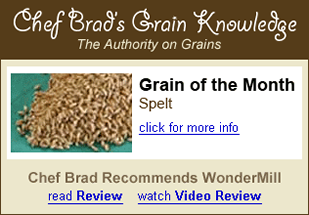 I am constantly looking for ways to encourage kids to eat whole grains. Not only is the concept of whole grains hard to teach, but they are constantly surrounded by refined junk. I use the WonderMill Junior to teach the kids that whole grain kernels go in the top, perfectly ground whole wheat flour comes out the side. Not only do they understand the concept now, but they love the pancakes we cook with the flour ground by the WonderMill. It is fine and smooth and make the best pancakes ever! They also get a huge "kick" out of turning the handle as fast as they can. Thanks WonderMill for making my job easier! " First I want to say how happy I am with my Wonder Mill. I have had it for 2 years and I love it. I brought it after becoming downright addicted to freshly ground flour that I would borrow off of a friend who had one. I haven't bought flour from a store since. I use it 4-5 times a week and love it. I know that I have sold at least 6 other people on your product - and have one friend who is borrowing flour off of me the same way I used to. We have a deal - I supply her with fresh flour and in return, she bakes wonderful things and shares them with me. I am pretty sure I have the better end of the deal, since grounding flour takes only a minute. This mill is powerful, hard working and has been everything it is promoted as. For a mill with this kind of power, I am amazed how quite it is. It goes through grain in no time. I am very happy with this product. If you love fresh ground flour I would encourage you to try this product. Let's start right with - I LOVE my WonderMill! I also have a hand-grinding mill that I have used, but decided to look around for an electric mill, because even though the Hand mill is great, my hands and arms got tired, quick. Have no fear though, I'll keep it for when the power is out, or we go camping, it does a great fine grind. So, I did some research, and then I saw and read some comparison tests. Well, I chose the WonderMill. This is a very capable machine and is a second time purchase. The first one I bought was called a Whisper Mill and has worked .This new machine the Wonder Mill was purchased as a gift ....If you follow the very simple directions it will probably last a lifetime.....Wonder Mill does a great job of making rice flour, great for the gluten intolerant. Highly Recommended! I make bread on a weekly basis, and so I use this every week to mill my flour. It makes the flour so fine you would almost think it was unbleached white. The bread from the milled flour has been so good. Delivery was in 3 days. The mill grinds at incredible speed. A real "wonder". Decided upon this instead of Kitchen-Aid wheat grinder attachment and we are very happy with that decision. As part of our Crisis Preparedness Plan (& Home Pandemic Plan) we bought a hand-mill, which is one of the best hand-mills, but still requires considerable energy to grind flour from hard wheat. This Wonder Mill (as long as there is electricity) is great-- and will enable us to store what we eat (bread from grain), and eat what we store. This... is just the ticket for fun and using wheat and other grains. Buy the Wonder Mill for fun cooking or crisis preparedness (assuming electricity). You could run a generator for 10 minutes and make 20-30 cups of flour--probably enough for a week or two of bread products. I am not the user of this Mill, but my wife is, and she thinks it is fantastic. This is a great product. I do recommend it. This is such a breeze to use! Quick & easy clean up too! Attach the bowl to the grinder, pick your setting, turn it on, dump in the grain, turn it off, remove the bowl, open the lid, & there's the flour ready for use! .....this way must be far superior to the flour you buy in the store. So fresh! Yum! There is a little filter on the top to keep flour dust out of the air. It works great. No mess at all while using this! The filter can be removed in a half a second to be cleaned & replaced in another half second. It is amazing how quick & easy this is! If people knew they could have fresh flour this simply, I think a lot more people would be grinding their own grain! We bake a lot. This mill is oh so worth every single penny! I read all the reviews on the best mills out there, and this one kept coming up best - plus I have 2 friends who love theirs! Because I have a small kitchen, I was concerned about the size. With the extra wheat collector container, I thought there was no way I'd find a place for it. But instead, I just store my extra wheat in the container in the freezer if I don't use it all right away. The mill itself is not too loud and works very quickly so that it's not really running very long when in use. It's certainly not necessary to wear earplugs like what I read about many of the other mills. This is my first grain mill, and I've just begun making our family's bread. I am very happy with this investment and highly recommend it! This is a champ! I love this mill. I have been using it almost daily for about 7 months now. It works fabulously and I have had NO problems whatsoever! !I love the flour this mill puts out and I do not consider this mill loud. It is about the same as a blender. I have been wanting a grain mill for several years now and finally was able to buy one. 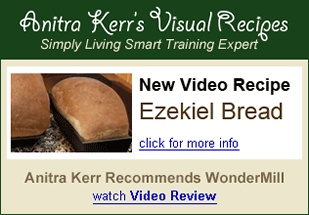 It is easy to use and does a great job at flour for bread. I found out that everyone employed at the place where I buy my grain owns this brand---a good confirmation that I bought the right mill. Fantastic product, works well. Grinds flour much finer than my prior KitchenAid attachment Love this mill. I've been using my Wonder Mill for years of whole grain bread and it still works just like it did when it was new. Follow the instructions, and you'll have this mill for a very long time. quiets right down while grinding. I received this about a month ago and have used it a couple of times to grind wheat and I'm seriously impressed. I did a bunch of research and decided on this mill. I grew up with a mother who would grind her own wheat each week to make bread, so I knew how loud these things can be, and how long it can take to grind wheat.. When I used mine the first time I was seriously so impressed. It was so quiet compared to what I grew up with...incredibly quiet. And...I ground 8 cups of wheat in less than 5 minutes...and it was beautiful soft fine flour. Let's just say after the first time...I'm in love! I'm now committed to making bread each week and already use the flour in all my baking. This ....is well built sturdy construction and grinds quickly. I have had this mill for a while and it works great. The flour is so fine that bread is almost like white bread, nice and soft. I have also ground corn and rye with great results. It is VERY noisy so I wear ear protection while using it. There is a foam filter that catches the fine particles so there is no dust to clean up. The canister can be used to store your flour which is very nice, or store your flour in another container and you can stack the canister on top of the grinder to use up less space when storing...... For those who might be allergic to corn try rice grits! I've wanted a grain mill for a long time and after reading some reviews, this is the one for me. It's quieter than I expected (with the lid on), arrived on time in perfect condition. Now we're having a hard time eating all the bread that I'm making. I have really liked this mill, personally. I have not found anything that I did not like about it, and I have had it for many years. I love my Wonder Mill. You guys have made a Wonderful product. Thank you! The 6 Wonder Junior Deluxe Hand Mills that we purchased for our Family & Consumer Sciences Department provide a wonderful, hands-on experience for our eighth graders! Having the opportunity to grind their own wheat gives the students a much better understanding of how kernels become flour. "Oh, now I get it!" was one of several comments from students on the first day we used them. The mills are very sturdy, which is a 'must' for school use because kids are hard on equipment . They can be mounted on a table in just a few minutes. They are easy to adjust and use. In my classroom, each of the four kitchen groups has a mill and the students within each group take turns grinding the flour needed for the day's recipe. We have had delicious results which include Whole Wheat Pancakes and Whole Wheat Snickerdoodles. The Wonder Junior hand mills are an excellent addition to our program! We love them and the way they are built we expect to have them in our classes for years to come. I've owned a Lehman's best for 16 years. It's inferior in every way. The hopper is a plastic funnel stuck in a hole and will fall off if you look at it wrong. The Wondermill Junior hopper that holds the and subject to rusting. The WM Jr metal burrs are stainless steel, the Deluxe also includes stone burrs. The Lehman's clamp is an inferior one screw design. The WM Jr is secure with a solid two screw clamp design. If the deluxe is out of your budget there is also the less expensive basic and the only difference is you do not get the stainless steel burrs (just the stone burrs) and you do not get the clamp, you can screw it to a table. Both items can be added later. The stone burrs are best for grinding flour. Yes the WM JR does a great job of grinding everything from wheat for flour to making peanut butter with the stainless steel burrs. I bought one of these from an Amazon seller in November 2009, after I got to play with one in a store. It has a very smooth grinding motion and feels sturdy. Well, lazy me, I didn't try to use mine until today, February 10, 2010. I found I was missing pins on the housing and figured that I would be SOL since it had been so long. My husband called Wondermill's number and got an answering machine. I'm now thinking, great - they'll probably never call back. Can you tell I've previously had bad experiences with customer-no-service at various companies? didn't ask to have them installed, but I'm sure they would have done that for us. Nice follow-up! I'm VERY pleased with their response and highly recommend them. From the pictures the mill looks plastic but it is anything but that. This is a solid metal mill. I bought both the metal and stone grinders. 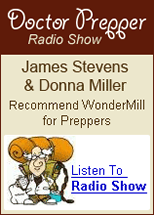 If you are into home preparedness or just want to make great fresh flour, I highly recommend this mill. I had bought a cheaper mill before and that one worked fine but this mill, although it costs more money, is a huge step up in quality. I can hand mill grain much faster on this mill than on the other cheaper mill I bought. This mill is built like a tank. My search for a great manual grinder came to a close when I unboxed the Wondermill Jr. In my opinion, this is definitely one of the best grinders on the market. Something like the Country Living .... But The Country Living ...also runs at over double the price. There are a number of cheaper alternatives on the market, but nearly all of them use plastic parts or don't seem very well made. The Wondermill Jr. is built extremely well, and I was highly impressed with the overall quality of the unit. The entire thing is metal, and is solid in construction with a durable finish. The dual clamp securely fastened the grinder to one of my kitchen countertops and the unit remained rock solid while I worked. The different burrs attach easily and can be interchanged within seconds. The unit includes a set of stone burrs intended for grinding grains, and a set of steel burrs that will grind everything the stone burrs do as well as nuts, sprouts, beans, etc, though at a 10-20% coarser grind. Adjusting the stones is easy, and allows you to grind at a variety of consistencies. The stone burrs look to last quite a long time, though I do plan on buying a spare set. One of the reviews and a couple of comments talked of some excessively long mill times for something like a single cup of flour. After using the mill myself last night, I have to assume that the reviewer was either exaggerating, or using the product incorrectly. Grinding a cup of hard red wheat into fine flour took me... minutes on my first attempt, and that included time spent learning how to adjust the tension for a coarser or finer grind. I got some flecks of stone in the first cup or so through (which the manual clearly warns you of in advance), and nothing after that. All in all, this mill is very well made by a respectable company, performs quite well, and is a great deal for the price. I'm very pleased with the purchase, and will be using it for a long time to come. I just got this hand mill the other day and decided to try it on some hard red wheat I had laying around. It took about 2 minutes to put together and about 5 minutes to figure out how tight to put to make bread out of it and see how it tastes. It does take some muscle power to work but if you are not in hurry and you pace yourself a little it's kind of fun to hand grind with it. I couldn't be happier with the results so far. I must also say that the build quality of this product was far beyond my expectations, it is truly heavy duty. I've thought about purchasing a grain mill for years. Ever check your local grocery store for red cornmeal? Coarsely ground? GOOD LUCK! Now I can make my own! I knew that freshly ground flour added a great deal to baked products and every recipe I've tried with flour from my new mill has proved it. I have found it easy to use although it takes some experimentation to get the right fineness or coarseness of flour. ...Freshly ground flour is fluffier than flour that has been factory packed I have not yet had a chance to use the metal blades that come with this mill but know that I will. I looked at some electric mills but they did not have the ability to process so many different kinds of grains, nuts and seeds. This grain mill works wonderful. We have only ground hard red wheat so far, but it makes fast work of it. I look forward to using it for many other grains and nuts in the future. Very sturdy unit works great! Made in India. I have yet to mill nuts. Warning... hand cranking will cause you to break a sweat. This is a wonderful hand operated grain mill. I bought this because I have been buying grain in bulk from Costco ... I wanted an option in case the power goes out. Not only does this work great, but you get to burn calories and build muscle while grinding your grain. I would definitely recommend this product. Quinoa: So far, this is my main staple. It grinds fine quinoa flour which is perfect for breads, cakes, no bake cookies, or even just pour 2:1 boiling water on it and have a grits/malt-o-meal hot cereal in about 30 seconds. A full hopper (4 cups) grinds down into fine flour Once again, I haven't tested quite EVERYTHING this product is supposed to be able to do, but so far, so good. It's a solid winner in my book. Good construction, seems like it will last a long time.